What a game filled with history. Previously 181 meetings between these 2 teams. Only 1 game ever in playoffs. 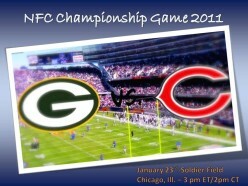 Green Bay Packers @ Chicago Bears for the 2011 NFC Championship and a trip to the Super Bowl. I am SO PROUD of the packers!!!! I live in WI and everyone is going CRAZY right now!!!!!!! I bet they are. It was an exciting game defensively. Packers have more talent ... therefore, Packers won. That being said, the Bears plays us tough. Heine looks tough and I wont be surprised to see a serious competition between him and Cutller in the preseason. Cutler is terrible ... I'm sorry, but he just is. Where has Chicago Bears been hiding this 3rd string QB? Caleb Hanie---This young man can play! Yeah, if nothing else Hanie gave that team a pulse and brought the crowd to life. Before he got into the game the Bears offense made that team look like they didn't belong in this game. Do you think Cutler was really taken out because of the knee? To me, it looked like he didn't even care, nor was he interested in the game in the least bit. Maybe he was really benched for being ineffective. The sideline reporters were even reporting that Cutler did not know when he hurt the knee. That wouldn't surprise me if Lovie Smith was just looking for a spark for the team. Like you said, the team was not playing well on offense until Hanie came in. Todd Collins was completely ineffective also. Yeah, I mean the team was so stale on offense with Cutler I think it is possible between that and Cutler's body language that Lovie realized he had to change things up and give the Packers a different look. The Packers were clearly prepared for Cutler in every which way. Bringing in Collins may have been to spark the offense and give the Packers something they weren't expecting. Then, Lovie and everyone else could see that clearly Todd Collins just doesn't have it anymore and quickly went to plan C (Hanie) to once again change things up, try to get a spark, and give the Packers a different look --it worked pretty well with Hanie, but I think they just ran out of time. Its been a little quiet at work, but I got to watch the game (so to speak) through the NFL website. It is still Monday morning here and am now 'watching' the Jets/Steelers game. What a great Super Bowl match up this will be. I would love to be at the game. Even on the outside watching that big screen. I have cousins there, Hmmm, maybe one of them have seats. Cool, you will be lucky if your cousin will have extra ticket for you. The Packers are off to the Superbowl. Aaron Rodgers will be the MVP, in a win! What Will Be the Record of the Chicago Bears? Hey everyone, I would like to get some feedback on how the Chicago Bears will finish the 2009 NFL Season. My prediction is the Bears will finish 7-9 again under Lovie Smith. I think it will be some miracle for them to reach 8-8 or 9-7 but who knows. I think the bears drafted pretty well for having such late picks. What do you think?